Planning an airplane-themed party and looking for party game ideas? Then you’re in the right place! This airplane game of charades is a great game for getting your little party guests laughing while acting silly. Sure, you could play this game with your family at the airport while waiting for your flight but you will likely get a few strange stares…but it’s okay when it’s all in fun, right?! Do you already know how to play charades? If not, here are some quick instructions. 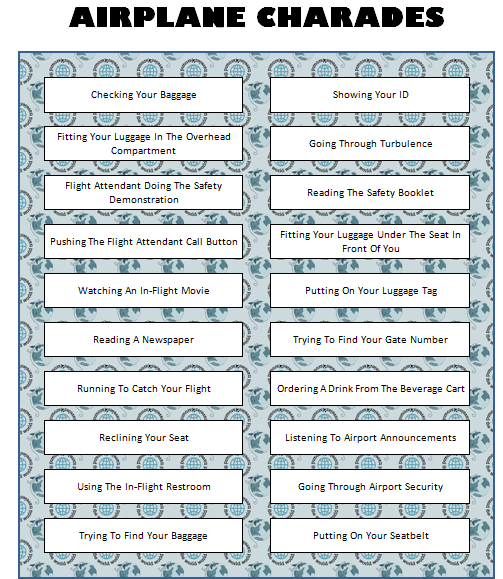 Print the free airplane charades game and cut out each of the charades (each white rectangle is one charade). Fold these and put them into a pail. Split your group into two teams and decide which team will go first. That team will decide who will act first (don’t worry – everyone gets a turn to be the actor during the game). Team One will then randomly select one charade from the pile and the actor will have 30 seconds to act it out for his/her team. The “actor” is not allowed to speak in charades – he/she can only act silently. If Team One guesses the charade in 30 seconds, they win a point. If they don’t guess it correctly, then Team Two has one chance to guess the correct charade for one point. The game then continues with Team Two randomly selecting a charade and continues with the teams taking turns selecting charades and switching who is acting from each team. For more airplane party ideas, games and more, visit our special Airplane category.